We take your health and wellness seriously. You’ll see that right from the start in our thorough intake process. Here’s an idea of what you can expect when you join Hyatt Training. After we hear from you, you’ll receive an email and/or phone call from either Jeremy Hyatt or Lee Carson to schedule a consultation. During the consultation (by phone or in person), we’ll discuss your exercise history, goals, limiters and schedule ideas. You’ll complete the intake process by filling in our new client intake form with your health history and background information. Afterward, Jeremy or Lee will recommend one or two personal trainers based on your personality, goals and schedule needs. Once you confirm a choice, they will introduce you and your new trainer. 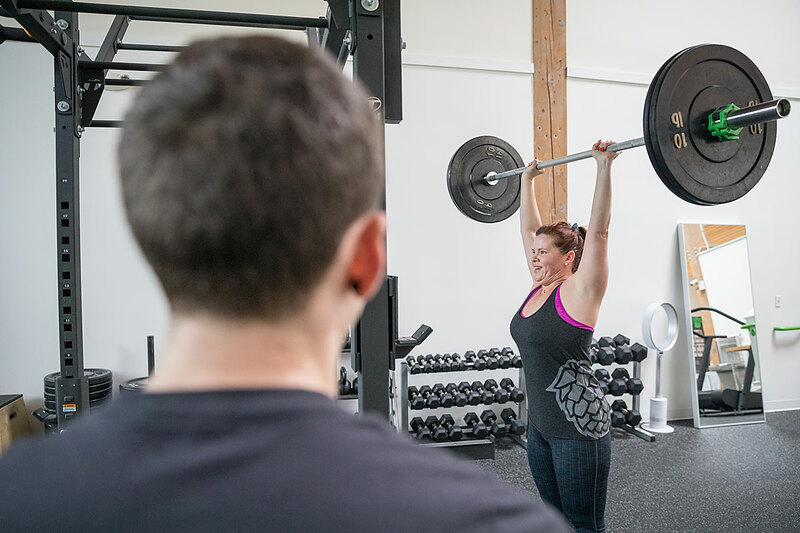 Your selected trainer will schedule a complimentary 60-minute assessment session with you to meet, review goals, and provide a 20-30 minute sample workout. After this, you’ll be off and running! We always set out to build longterm relationships, so we take a little extra time ensuring a good match for clients and trainers. Each trainer handles his/her own scheduling, billing and assessments so your trainer will reach out immediately to set everything up with you. Normal gym attire applies at Hyatt Training. Comfortable shorts, tights and shirt. Gym shoes should be clean, and we’d prefer they were used for gym-work only. We strive to keep the gym as clean as possible at all times! There are two designated parking spots for Hyatt Training clients in front of roll up door and four additional visitor spots available in parking lot. Timed and free parking spots are available on surrounding blocks. There is no need to “check-in” when you arrive. Your trainer will be watching for you to arrive at the front desk. First order of business will be to sign a waiver and set up your account with Hyatt Training. Your credit card on file will be billed on the first of each month for your studio fees ($35/month) during your time as an active client. This fee gives you access to the studio not only for training sessions but also for solo workouts during open hours. Please use the lockers in the locker rooms for gym bags, coats, etc. There are showers with soap, towels and ample amenities including hair dryers, cotton swabs, mouthwash and even hair ties to make your visit more comfortable. We have a cold filtered water fountain with bottle fill station. All trainers perform some type of movement assessment at the start of your relationship with them. Most use a form of the Functional Movement Screen which gives us an idea of how you move and how they need to approach your sessions. Warm up: Jump on a treadmill, elliptical machine or bike for 5 easy minutes to get the blood pumping. Corrective exercises: You may have issues you are dealing with that need special attention (lacrosse ball work, stretching, foam rolling, band exercises, etc). Fitting that in between the warm up and your session is a great time. Personal training session: Expect to be pushed (safely, of course) and to learn a variety of new exercises and movement patterns to help you reach your goals. Consistent feedback is important to all of us so please share information with your personal trainer, especially if something hurts. Post-workout: After your personal training session, feel free to stay and stretch, foam roll, work on corrective exercises, do some more cardio, etc. The studio is yours to use as long as you like! Hyatt Training is also a great home base for Portland walks and runs as well as a great place for indoor cardio and strength workouts. As a member you can use the Hyatt Training studio on your own to supplement workouts with your personal trainer. The studio hours are 5 a.m. to 8 p.m. Monday through Thursday, 5 a.m. – 3 p.m. on Friday and 7 a.m. – 12 p.m. on Saturday. Each week you will find three new chalkboard workouts (one bike, one strength and one High Intensity Interval) to provide structure for you. Welcome to Hyatt Training!